To start record, just click the record button to start recording. To control recording, using following button. button to pause recording, click again to resume. 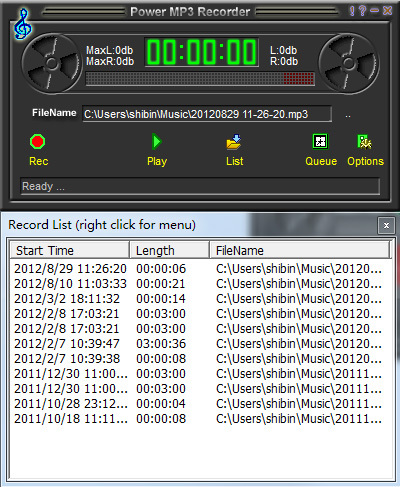 The FileName shows current recording file name, type and destination. Play - play the recording, you can also double click it to play it. Locate - open the windows file explorer, and locate the recording file. Edit with Cutter(Classic) - edit the file with Power Mp3 Cutter Classic. Edit with Cutter(Professional) - edit the file with Power Mp3 cutter Professional.